A warming bowl of beef casserole is the ultimate comfort food for a cold, rainy day. Sally serves hers with a creamy celeriac mash, the perfect accompaniment to soak up the rich, meaty juices from the stew. Sometimes when the weather is cold and drab you just need a hearty stew to warm you up. 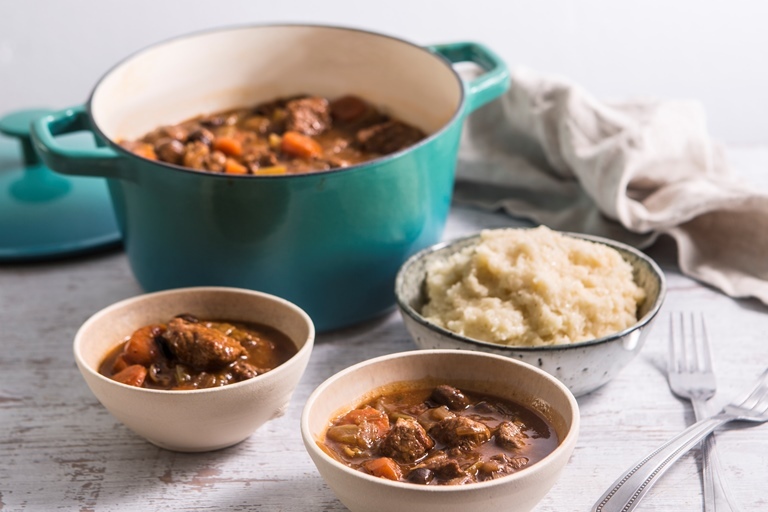 Beef casserole is my go-to comfort food. It is simple to make and once prepared you can forget about it for a few hours, as it gently simmers away, filling your kitchen with comforting aromas. Upon your return you will find a lovely velvety stew with moist chunks of meat that are literally falling apart. Mashed potato is the obvious accompaniment to a beef casserole but for something a little different I like to serve it with a buttery celeriac mash, made the same way as mashed potato but with a subtle celery flavour that perfectly complements the stew and counts towards your five-a-day.